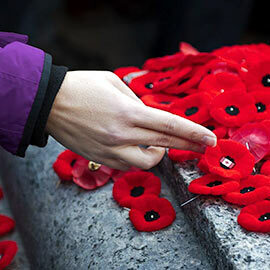 Debra Nash-Chambers, an instructor in Laurier’s Department of History and North American Studies program, knows the verses of Lieutenant-Colonel John McCrae’s memorial poem, In Flanders Fields, inside and out. Nash-Chambers served as a historical consultant on the City of Guelph’s In Flanders Fields at 100 Taskforce for 18 months in preparation for the poem’s centenary this year. With expertise in local and public history, including that of Guelph’s hometown hero McCrae, she presented a nationally distributed webinar, “Guelph Remembers John McCrae” for Canada’s History magazine in addition to several public interest and academic lectures. Her webinar tells McCrae’s story beyond the notoriety of In Flanders Fields – one of a bright student, skilled doctor, gifted writer, and brave soldier. McCrae – no stranger to public service – enlisted in World War I at the age of 41. McCrae and his comrades of the First Brigade of the Canadian Field Artillery were mobilized to an area of Belgium called Flanders, where the Second Battle of Ypres unfolded. Battles of artillery fire and chlorine gas created an endless landscape of death and loss. McCrae alternated his duties as needed, from that of brigade-surgeon to frontline soldier. One loss in particular struck McCrae above others. His good friend and fellow soldier, Lieutenant Alexis Helmer, died instantly in a German shell attack on May 2, 1915. In the absence of a clergyman, a pious McCrae conducted the burial service for the few remains of Helmer that could be laid to rest. On May 3, 1915, McCrae penned his memorial poem in response to Helmer’s death. Poppies growing among the makeshift gravesites in the fields of Flanders served as the landscape from which a chorus of recent war dead urged the living to continue the battle. Response poems flourished worldwide after the publication of In Flanders Fields in the British magazine, Punch, in December 1915. The United States was the first country to adopt the poppy as a symbol of remembrance. Many Commonwealth countries followed suit shortly thereafter. One hundred years later, the poppy lives on as the international symbol of war remembrance. In Flanders Fields was McCrae’s second last poem before his death in January 1918. His final poem, The Anxious Dead, was written in late 1916. Additional information on the life of John McCrae is available in Nash-Chambers’ article, “Memorializing Lieutenant-Colonel John McCrae: Civic Commemoration and the 100th Anniversary of In Flanders Fields” on Laurier’s Scholars Commons website.